Here I present you with my V-Ray Translucency and Wax studio setup for 3D Studio Max. In this pack you will find complete render setup for rendering wax and other translucent materials with V-Ray, including 5 premade shaders for you to use. 1 V-RAY PLANE PLATFORM – To hold your model or models. 1 LIGHT RIG – By default, sphere lights and HDR are being used for a dramatic lightning preview. Platform object is excluded from sphere lights. 1 HDRI MAP (INCLUDED) – If you want to use your own HDRI map, you can do it in a single click! Change the map instance in material editor and you are set! 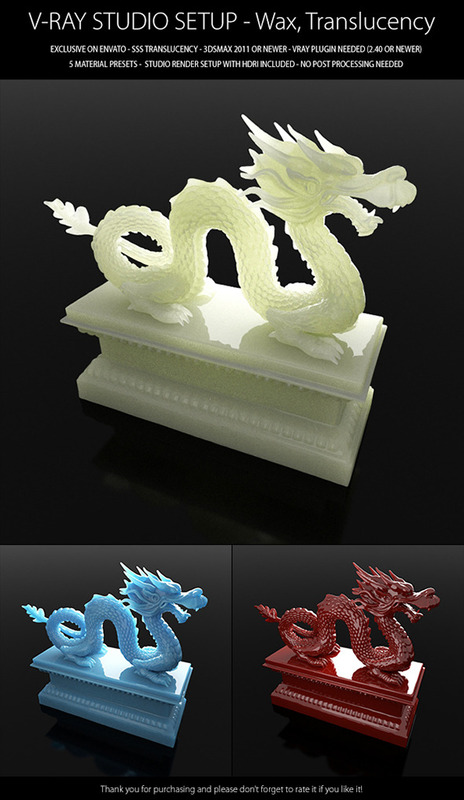 5 INCLUDED SHADER PRESETS FOR TRANSLUCENCY – White wax, yellow wax, green wax, blue wax and red semi-tranlucent liquid. 1 PHYSICAL CAMERA – Place your model infront of it instead of my preset spheres. 1 COMPLETE RENDER SETUP – Configured for production, hit “Render” and enjoy! If you need different resolution, you can change it in V-Ray render settings. For any help or information about the item, feel free to contact me over e-mail or directly here in comments. I will try to explain or help with anything that you need. To use this pack you will need to have V-Ray 2.0 or newer installed and 3D Studio Max of version 2011 or higher. Preview scene and free dragon model are also included. Thank you for purchasing and please rate it if you like it!